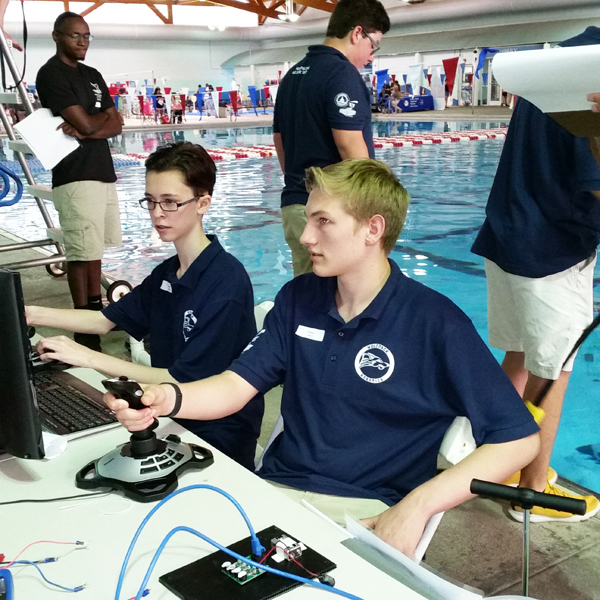 Gray’s Reef National Marine Sanctuary hosted its annual Southeast Regional Marine Advanced Technology Education (MATE) Remotely Operated Vehicle (ROV) competition on April 22 at the Chatham County Aquatics Center. Spearheaded by Gray’s Reef’s events and volunteer coordinator Jody Patterson, staff and volunteers from the sanctuary as well as Gray’s Reef National Marine Sanctuary Foundation welcomed 16 teams of students who came to compete for first place and a shot to compete in the national MATE competition. The competition is open to young scientists from kindergarten to college, and it challenges them to create innovative solutions to real-world problems faced by the National Oceanic and Atmospheric Administration and other marine industries. This year’s theme was “Port Cities of the Future,” which prompted students to use their underwater robots to perform tasks that could be utilized to clean and maintain the waters of port cities. MATE encourages students to develop their entrepreneurial skills by creating a business plan that supports their innovative marine technology as well as marketing materials that showcase their work. Students choose from four classes of competition in which they can present their marketing materials and demonstrate their robots. Vying for a spot at the international competition was the eight-time champion team named InnovOcean from Carrollton High School as well as five other teams in the ranger class. Although the competition was fierce all day, in the end, first place fell to the Wolfpack Robotic Team from North Paulding High School in Dallas, Georgia. Gray’s Reef congratulates all the teams that competed in the Southeast regional competition and will be cheering on the Wolfpack Robotic Team in June as they compete in the international competition in Long Beach, California. This entry was posted in skidaway campus notes and tagged competiton, gray's reef, mate, remote operated vehicles, rov. Bookmark the permalink.